Access to Treehouse No. 7, “Solitude,” at the Treehouse Lodge in the Paraiso region of Peru, is by suspension bridge. 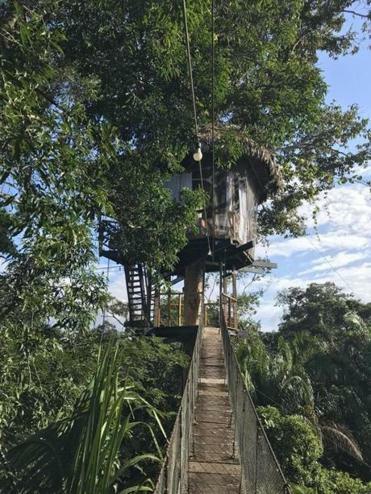 Our room was 65 feet up a tree, high in the canopy of the Amazon jungle, where we were lulled to sleep each night by a symphony of animal chitchat under a night sky that reminded me of a planetarium show in a power surge. To reach our perch required traversing a network of boardwalks, then ascending flights of circular wooden stairwells built around trees, then finally traversing two suspension bridges that seemed more suited to an Outward Bound course than a luxury resort. The lodge is the creation of one Vance Cook, a 53-year-old mountain climber from Utah (his summits include Everest and Makalu) who has taken his desire to build hotel rooms with a view to new heights. My wife and I spent four nights at Treehouse Lodge in April, for $287.50 per night. I had found the lodge on a whim, wondering if such a novelty might exist in the Amazon. Up popped the lodge. Most of the rooms require only stairs to access. Others require suspension bridges. “Solitude,” No. 7 on the room chart, put us farthest away and high in an Earth-made aviary. I thought nothing could top the boat cruise — until we arrived here. Mind you, my expectations were low. Earliest reviews of the new lodge — which I had not bothered to read until the night before our arrival — had derided the guest service. We experienced nothing of the kind. Not until I interviewed Cook upon our return did I understand that his learning curve in a new career had been steep and garnered poor early reviews. “Bad early choices,” said a man who was refreshingly honest about his inaugural poor management team. Cook had made a fortune developing video games. Then he spent a fortune building the lodge. From computer games straight into hospitality . . . there was probably potential for error. The Lodge, located on the intimate Yarapa River, sits a half-dozen miles above the confluence of the Ucayali and Maranon rivers to form the top of the Amazon River. Glacial runoff in the Andes Mountains descends 18,000 feet here, then meanders 2,000 miles, losing just 300 feet of elevation, to the Atlantic Ocean. Our room was a screened polygon 18 feet in diameter. It was equipped with potable running water, a cold shower, a toilet that discharges down a camouflaged pipe to a hidden treatment center, and a canopy bed draped in mosquito netting. I am used to hitting many objects on nightly trips to the loo. I had never kept running into a tree trunk — of the tropical hardwood tree that was our spine. Nor had I heard the cacophony of wildlife sounds, almost as if Disney had placed hidden speakers in our tree. The room fee included seated breakfasts and dinners in a central grand lodge located precisely 675 steps from our treehouse. The fee also included a boat and private guide for the duration of the stay. I learned early that Josmel Macuyama Manihuari, a.k.a. Marden, is an Amazon treasure. He was born in one of the many nearby villages where the indigenous population now speaks not only a tribal language but Spanish, and increasingly, English. On a medicinal jungle walk, Marden introduced us to the Cordoncillo plant. Need novocaine? Chew its leaves to lose all sensation in your mouth. Need happy? Brew up a concoction of Pusangade Motelo leaves. Then do up your seat belt. On myriad explorations by outboard Marden pointed out anacondas, poison dart frogs (Note: the prettier the frog, the deadlier), maw caws, piranhas, 10,089 roosting parrots (estimate), a half-dozen species of monkeys, a fist-size tarantula, dozens of sloths, the nocturnal red eyes of alligators caught in a flashlight beam, and so many white freshwater dolphin that we eventually stopped looking when they surfaced for gulps of air. The list went on. And on. On our one rainy day (and April is deep in rainy season), Marden guided us step by step through the fabrication of a blow dart gun; he drove us by boat to a home where we hugged — and were hugged by — rescue sloths; and he introduced us to Ahuanari Manihuari, a.k.a. Karen, who taught in her one-room house shared with a half-dozen children how to laugh hard while we weaved ornamental butterflies from dyed straw. Marden grew up a neighbor of Karen but he lives today in Iquitos, a frenetically paced city located about a three-hour boat and bus ride from the lodge. One morning in the predawn light, he and I sat miles up the Yarapa River listening to the awakening jungle. Although we basically were in his backyard, Marden was mesmerized as if it was all new, his head cocked and gaze alert as a concert of birds chatter slowly came to life. He has one foot in Iquitos, the other in the jungle, but confessed that both feet eventually will land here. He was a boy at home. David Arnold can be reached at david.arnold90@yahoo.com.